A random urine calcium/creatinine ratio (UCa/Cr) is of practical use in screening for hypercalciuria. However, due to worldwide variations, reference values for the pediatric population are not yet well established. Furthermore, no study has been conducted to establish normal UCa/Cr values in young African-American (AA) children. It has also been previously reported that an elevated UCa/Cr is related to a high urine Na/K ratio (UNa/K). 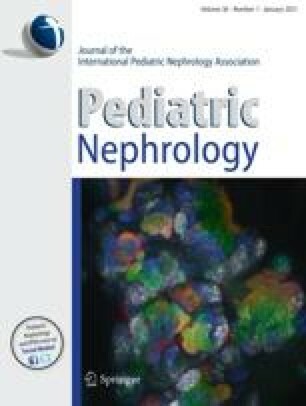 The objectives of the present study were: (1) to set normal values of random UCa/Cr by age and race in the pediatric population of Metropolitan Kansas City, (2) to identify potential racial differences in UCa/Cr between Caucasian (CS) and AA children, and (3) to determine the relationship between UCa/Cr and UNa/K in healthy children.A total of 368 healthy children of both genders were enrolled in the study. They were divided into four age groups as follows: (1) <7 months, (2) 8–18 months, (3) 19 months to 6 years, and (4) 7–16 years. Each group was subdivided into AA and CS. A non-fasting random urine specimen from each subject was analyzed for Ca, Na, K and creatinine.The median UCa/Cr values for AA were: (1) 0.13, (2) 0.09, (3) 0.06, and (4) 0.04 and for CS they were (1) 0.26, (2) 0.11, (3) 0.10, and (4) 0.09. The data showed a strong inverse relationship between UCa/Cr and age, the youngest children demonstrating the highest UCa/Cr. In each age group, UCa/Cr in CS exceeded the corresponding value in AA. The age-dependent 95th percentiles of UCa/Cr values for CS were (1) 0.70, (2) 0.50, (3) 0.28, and (4) 0.20 and for AA they were (1) 0.38 and (3) 0.24. Due to outliers, the 95th percentile could not be established for the other two AA subgroups. The relationship between UCa/Cr and UNa/K was found to be extremely weak in both AA (r 2 =0.00005) and CS (r 2 =0.02). On the other hand, a strong linear correlation was observed between UNa/K and age (CS r 2 =0.23, P<0.001, AA r 2 =0.19, P<0.001), explaining in part the lack of correlation between UNa/K and UCa/Cr.We conclude that the child’s age, ethnicity and geographic location should be taken into consideration when assessing UCa/Cr ratio. Contrary to what has previously been reported in hypercalciuric children, no significant relationship was found between UCa/Cr and UNa/K in healthy children.